Forbes business magazine, well-known for its lists and rankings of the world’s top companies, has named Nodaway Valley Bank #1 in Missouri. 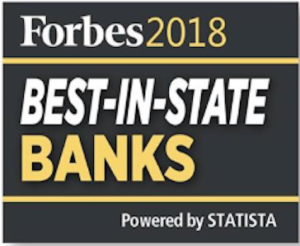 Forbes partnered with market research firm Statista to compile a list of the nation’s top 124 in-state banks in a survey of overall customer satisfaction based on trust, terms and conditions, branch service, digital services and financial advice. Founded 150 years ago in Maryville, Missouri, Nodaway Valley Bank serves northwest Missouri with eight locations in Maryville, Mound City, Savannah and St. Joseph. The bank reported $877 million in resources at June 30, 2018.